I started to write this last night (Wednesday), but I had so much to get ready for this weekend that I just couldn't finish it. Instead, I got to the airport a couple of hours early so I can write while I wait. I don't want to forget anything! I'll be in Bethlehem this weekend for the Runner's World Half & Festival, so I'm not sure if I'll get a chance to post, but I'll try! I'll just go through those in order, and write anything notable that comes to mind. The emcee, John Hockenberry: This guy was phenomenal at his job! He was very entertaining, quick with the one-liners, and excellent at interviewing the speakers. Brooke Martin: At 12-years old, Brooke invented a way to stay connected with our pets even while we're away from home. It's called the ICPooch, and it's basically a way to video "chat" with your pet, and even deliver a treat (remotely) with the push of a button. Brooke was extremely well-spoken, especially considering she's only 14 years old now, and her invention is so smart! Scott Stulen & Will Braden: Scott is the curator and producer of the Internet Cat Video Festival (a competition that celebrates cat videos on the internet). Will submitted his cat video to the first festival, and was selected a winner of the Golden Kitty Award. 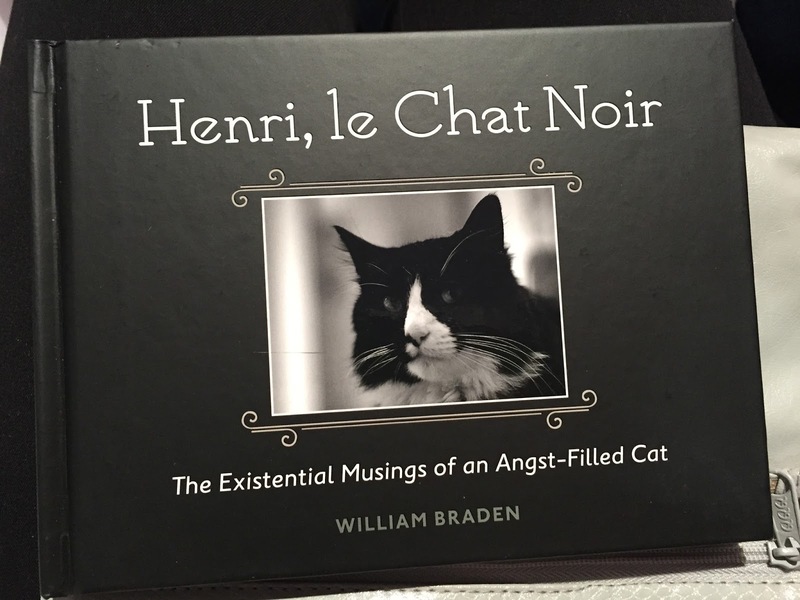 You may have seen his videos on YouTube (they are HILARIOUS)--just search "Henri the cat". Now the two men work together on creating the video festival. Ed Creagan: Ed is a doctor who spoke of how important pets are to people who are dying. He works with patients who are dying, and has had over 30,000 encounters with them in his career. He said that having a pet gives people hope, and helps them to fight their diseases. It has even helped family members reconnect. B.E.A.T. NYC: A group that was very entertaining to listen to! Hard to describe, but they are a rap group. I took a video, but had trouble uploading the video at the airport. Grr! I'll try and add it here later. Dogs of Instagram and Cats of Instagram: If you're on Instagram, and you like photos of dogs or cats, you've got to follow them! Stan Marks: Stan told us the story of Bean, a dog that was nearly euthanized because she was constantly getting pneumonia from aspirating her food (a side effect of her muscular dystrophy). After testing and scanning, they learned that when she tried to swallow, the food wouldn't go into her stomach, so it would come back up her esophagus and then she would aspirate it into her lungs. Bean became the first canine to receive a total laryngectomy. Her life was saved with the surgery and a feeding tube (her owner now "feeds" her through a tube directly into her stomach). She gotten a lot stronger, gained weight, and is now happy and healthy. Janet Jackson: Janet is a researcher at Purina research and development, and she spoke of a topic that was of particular interest to me--keeping your mature pet's brain sharp. I had never given this topic any thought until it was very clear that Paolo had dementia. It slowly progressed, and the last year or so, Paolo had all the classic signs and symptoms. Janet showed a video of a dog that had the "signs of old age", like confusion, difficulty walking and understanding commands, and constant pacing through the house. Purina's research and development team discovered that by adding MCT's (medium chain triglycerides) to the dog's diet, they could reverse those symptoms. Seeing the "after" video of the dog was very interesting to me! The symptoms that were in the first video had been reversed, and the dog was doing much better. Purina put the MCT's into a new food line, which will be available in January. Victoria Stilwell: Victoria is a dog trainer that uses positivity to train dogs. Everything she said was completely the opposite of what I'd read/heard/watched before, mainly from Cesar Milan. She explained that dogs don't see us as dogs, but as people--we are an entirely different species, obviously--so therefore, they don't think of us as a "pack leader". She explained how positive reinforcement (particularly with food) is the best way to train a dog, and she backed it up with scientific proof. I don't have a dog, so I can't really give an opinion, but I thought her argument was very convincing. Rita Garza: Rita is with Urban Resource Institute (URI) of NYC. URI provides vital services to victims of domestic violence, and after a ton of hard work, they finally created a shelter for people to stay WITH their animals. She said that there were so many women who would stay in abusive relationships out of fear for their pets, because pets weren't allowed in the shelters with them. A woman named Pamela, who is a domestic violence survivor, shared her story and how she was extremely grateful to be able to keep her "fur family" with her when she left her abusive husband. Lisa Spector and Joshua Leads: Lisa and Joshua came together to create music for pets after Lisa (an amazing pianist) discovered that her dog was calmed when she played the piano. Joshua is a sound researcher and music producer who studies the effect of music on the nervous system, both in people and animals. Lisa and Joshua came together to create "Through a Dog's Ear" and "Through a Cat's Ear" CD's to play for your pets. I was extremely skeptical about this until I saw the video of the music being played in an animal shelter. The dogs were all sleeping calmly, and not barking and jumping all over the place like they usually do in a shelter. I got a cat CD while I was there, so I'm curious to see if it has an effect on my kitties! Mayhem Poets: I really wish I had gotten this on video, because it was amazing! Three poets--Kyle, Scott, and Mason--gave a poetry reading (MUCH more entertaining than it sounds!) about pets. Mark Deadrick: Mark is literally a rocket scientist, and when he saw pictures of a chihuahua, TurboRoo, who was missing his front legs circulating online, he decided to use a 3D printer at work to create a mini prosthesis for the dog. After a couple of failed attempts (he had no idea just how tiny TurboRoo was, so they were too big), he created one that fit really well, and now TurboRoo can run around like the other dogs ;) He was absolutely adorable! Pia Salk: Pia is a psychologist who has always had a special bond with animals. When she assisted with Hurricane Katrina recovery efforts, she spent her time rescuing pets. She explains that it's normal, and not at all shameful, to love your animals just as much as you would people, and that the bonds formed with our pets are just as special. Kurt Venator: Kurt is a veterinarian for Purina, and he talked about how the roles of pets are changing in our lives. He gave the example of his grandfather, who owned a dog. The dog was only allowed to sleep in the dog house outside, and when Kurt tried finding a photo, there weren't any photos of the dog. In the next generation, dogs were brought into houses, and taught tricks. And now, pets are treated like members of the family. So, that was the summit in a nutshell. I left with not only a longing to see my cats, but also a new appreciation for dogs. I don't think I'll ever be a "dog person" in the way that I'm a "cat person" (usually, it's one or the other), but I learned quite a bit about them. 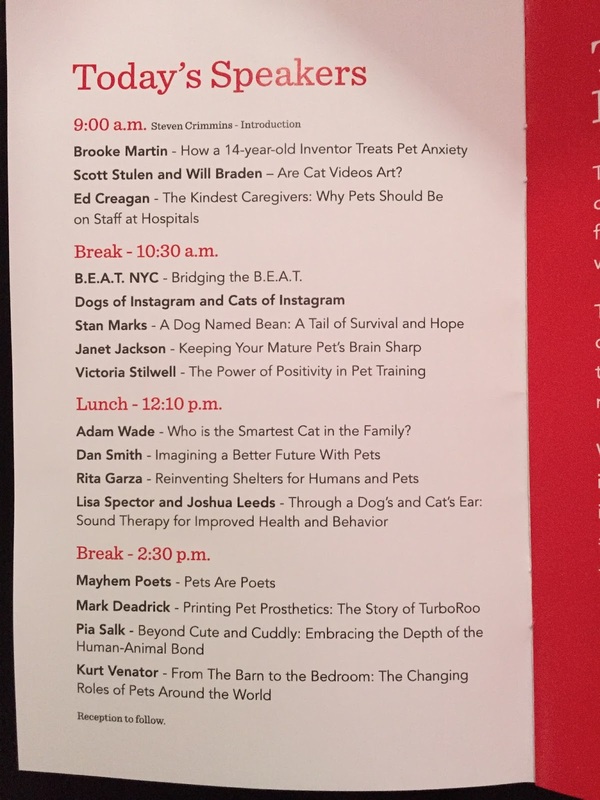 I'm grateful to Purina for inviting me to the summit--it was not only interesting, but very fun, too! Certified dog person here, but I do love and appreciate kitties too. :) I wouldn't mind having one if the hubby wasn't allergic. The summit sounds like it was so much fun! I am most impressed with the shelter that allows domestic violence victims to bring their pets with them. This not only protects the pets that the abuser might lash out against, but I'm sure the victims are happy to have a little soul with them who loves them unconditionally. I caught a bit of the summit online between projects at work. I was lucky enough to see Victoria's presentation, I really like her. It was interesting to hear your perspective as an outsider who was not familiar with her. It also makes me sad that most of the US is like you and equates Cesar Milan and his methods to dog training. I want to know how the heck someone gets not just an invitation to this event, but a paid trip by Purina.... Especially someone who isn't a professional in the pet industry. I love your pet conferences! As a fellow cat person, I really enjoy the insight! Thanks for sharing so much detail! What a fun day!